Greek tennis prodigy Stefanos Tsitispas has become the talk of the tennis world after his impressive in the Australian Open in Melbourne, protothema.gr reports. The Greek champion has displayed his undeniable talent and athleticism on the court, but he has also shown a great ability to enchant the media with his magnetic personality. The tall, almost lanky-like, 20-year-old Greek, who will face another of the big three, multi-Grand Slam winner from Spain Rafael Nadal for a berth in his first Grand Slam final, has got that ‘It’ factor necessary for a player who wants to go far in the sport. In his most recent post-match press conference following his victory against Bautista Agut, Stefanos it became apparent that Stefanos was feeling comfortable before the cameras and the journalists. He felt in his element. Tsitsipas showcased his full off the court talent, replying with flair and humour, but also appears very mature and down to earth for his age. At one point one of the Australian reporters present asked him how close he had come to receiving the Australian citizenship, to which Stefanos responded that he was never “close”, adding that he felt proud to be playing for Greece and representing the blue and white of the flag. 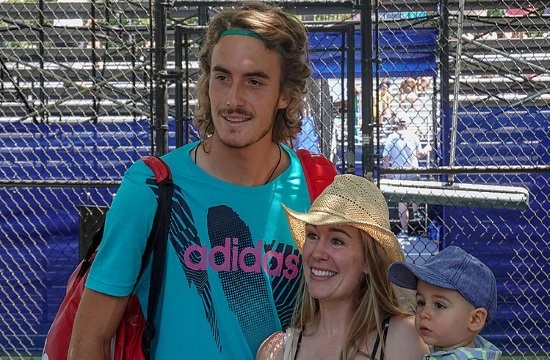 Judging from the comments of adoration and praise by the rather picky and quite demanding tennis fans under the post-match press conference video, Tsitsipas looks well on his way to heading the pack of the next-Gen group vying to take over from the “old guard”.